No parameters to determine: All parameters -- Kernel-sigma, alpha and the number of clusters can be automatically determined. Competitive results with existing methods such as K-Means and Spectral Clustering. Assigning points to Clusters with respect to the underlying intrinsic structure of the data. Outlier Detection: The method automatically determines outliers in the data set. This can lead to additional insights. In the paper we compare our method with Spectral Clustering. Out-of-sample:New data-points can be assigned to an existing cluster model without rebuilding the model. Successfully applied to real world data: handwritten digits (USPS), Yale Face Database B, Robot Data. The algorithm works well for image data that has an underlying intrinsic structure. 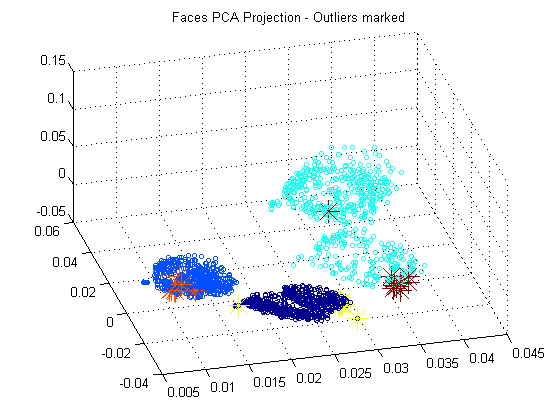 Outlier Detection with Yale Face Database B: PCA-projection of the photographs (1200 dimensional). The outliers the algorithm identified have been marked and are at the most outside points of the blobs. Feature selection - If too much noisy features are present, the underlying intrinsic structure might not be found. Scalable - The current method is slow though it's abilities for clustering should be applicable to practical Data Mining tasks. The Matlab code from our paper is available here. Links to other interesting clustering stuff on the web.